TEHRAN – Iran said on Sunday it had negotiated to pay only about half the announced price for 80 new Boeing airliners in an order that the American planemaker had said was worth $16.6 billion. Boeing and its European rival Airbus have both signed huge contracts this month to supply airliners to Iran, the first such deals since international sanctions were lifted under a deal to curb Tehran’s nuclear program. Replacing Iran’s antiquated civil aviation fleet is one of the biggest economic opportunities of the 2015 accord to lift sanctions, which was negotiated by the outgoing administration of U.S. President Barack Obama. President elect Donald Trump is a vocal critic of the pact. Despite Iran’s great need for new planes to replace those from the sanctions era, it has entered the market at a time when Boeing, Airbus and smaller planemakers have all faced a downturn in orders, and are therefore expected to offer deep discounts. Boeing said this month it was cutting production of its 777 long-haul jet due to a drop in demand. “Boeing has announced that its IranAir contract is worth $16.6 billion. 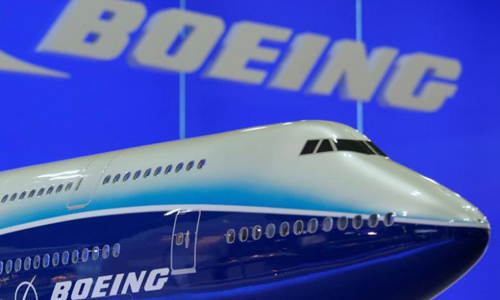 However, considering the nature of our order and its choice possibilities, the purchase contract for 80 Boeing aircraft is worth about 50 percent of that amount,” said Deputy Transport Minister Asghar Fakhrieh-Kashan, quoted by Iran’s IRNA state news agency. A Boeing spokesman in Dubai was not available to comment. Airbus’s contract to sell 100 jets to IranAir, signed on Thursday, would be worth $18-$20 billion at list prices, but the head of IranAir has been quoted as saying the value of the contract would not exceed $10 billion. The government of President Hassan Rouhani, a pragmatist, has pushed to finalize aircraft deals to show results from the nuclear accord with world power to end sanctions. He faces criticism at home from hardliners over the cost of the purchases. Fakhrieh-Kashan also said on Sunday that IranAir may exercise an option to buy 20 more aircraft from ATR, a European maker of regional turboprops, in addition to a planned firm order of 20. A team from the planemaker would arrive in Tehran next week for final talks. “The final round of talks will be held with ATR representatives (next) week and we expect the IranAir contract to be signed … in the following week,” he told IRNA. “The purchase of 20 planes has been finalised and Iran may buy 20 more planes,” said Fakhrieh-Kashan, adding that the contract for 20 planes was worth less than $500 million.